Scotland will begin building the world's largest floating wind farm. The construction of the wind farm will start this year after its developers were granted a seabed lease on Monday. The wind turbines will operate around 12 to 18 miles off the coast of Peterhead, Aberdeenshire. The Norwegian energy company, Statoil who is building this project plans to build five 6 MW turbines. The Hywind project expects to have a total capacity of 30 Megawatts. 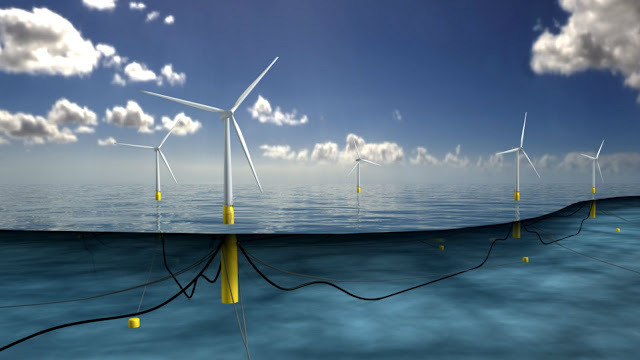 Unlike other wind turbines which use the seabed as a foundation, this project will apply floating steel tube tethered to the sea floor as the foundation for the turbines. The project expects to power 20,000 homes once completed. The process of erecting wind turbines will begin at 2017 and electricity production will commence at the end of next year. Scotland is making use of renewable energy to the full extent. Last year, 50% of Scotland's electricity came from renewables and just this year, they shut down their last coal plant.